3 lb. or 4 lb. Straight from small midwest farms, processed at our local woolen mill, this wool is carded in a sheet. We sell it either by the sheet (batt) or by smaller pieces by the half lb. The color of the sheep’s wool accounts for the different colors of batting. The wool batting comes off the carder apporximately in the size 66″ x 88″, often a little larger in areas. 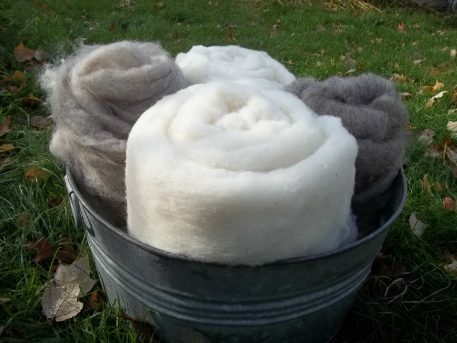 The longer the carder spins, the more layers of wool fibers are laid on top of each other and the heavier and fluffier the batt becomes. The two different weight options above (3 lb. or 4 lb.) of the wool do not change the width or length of the batt, just its thickness, the 4 lb. being thicker. After compression, usually about 6 months, the 3lb. wool settles down to its final height of 1/2″ thick per batt. the 4lb. wool to 3/4″. Despite its compression, it will retain its comfort and insulating properties while losing its cloud like enveloping feel. 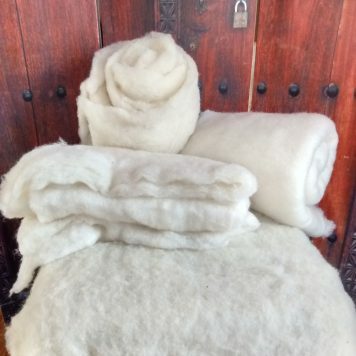 This wool batting is used in our wool topper, wool pillows and wool comforter. 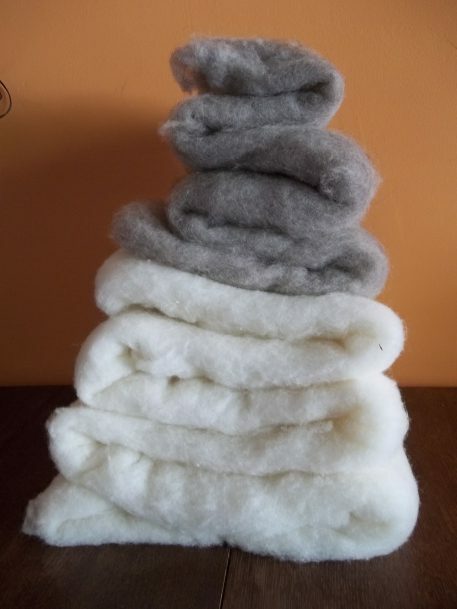 To create your own 3″ topper, see our wool topper kit here. 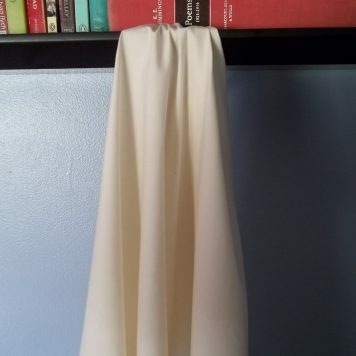 This batting is often commonly used to wrap the latex to provide comfort and protection to the latex as in the video on our How It Works page, here. For the crafters, this wool felts up nicely, stuffs without lumping and dyes easily. For the hand spinner, make your own roving by tearing off strips. 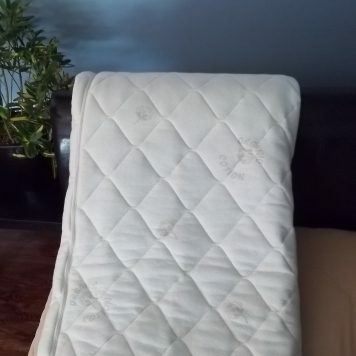 For bedding, this batting is perfect for making your own comforter and quilt as it will be able to retain its loft since you are not lying on it every night. 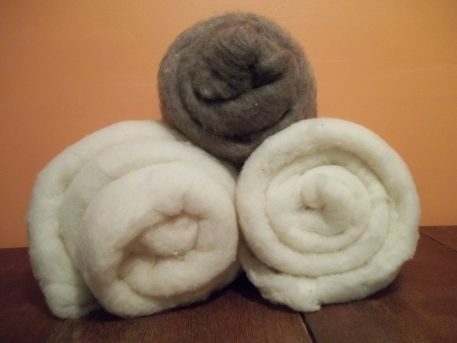 A wool topper will also provide a smooth, medium layer of softness to your bedding. Each batt comes in a the same width and length, generally 66″ x 88″. The wool batting is easy to stretch to a larger size or can be cut or torn to smaller sizes. To stretch, using the palms of your hands on the wool, gently and slowly push your hands away from each other, pulling the fibers apart slightly. Continue this pulling in rows down the batting until it is the size you want it to be. Here are some examples of sizes you can use. 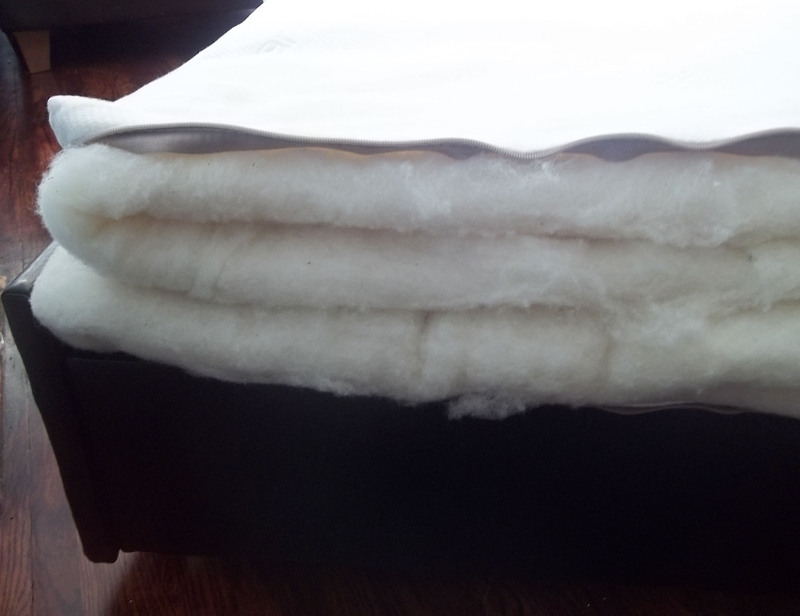 The wool batt 66″ x 88″ is the right size for a queen mattress or topper. Wrapped around a crib mattress, it would wrap twice horizontally plus once vertically, making the top of the mattress gently cushioned. 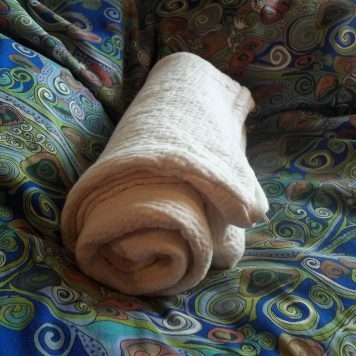 A wool batt stretched to 72″ x 90″ is enough to wrap around a 6″ twin perfectly or a 3″ full with a slight stretch. 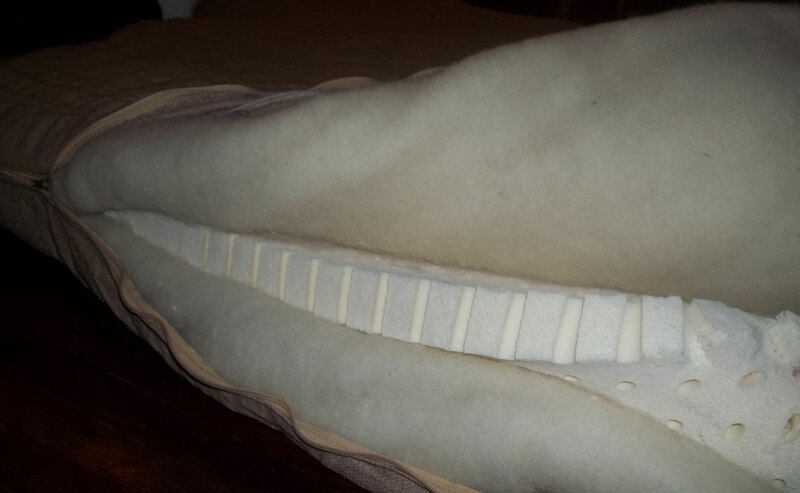 Larger sizes of mattresses will require multiple batts to create a wrap. Some like to use the batt to wrap their natural latex, prolonging its life by protecting it from sunlight, heat vents, and other elements that cause it to deteriorate. Cut in half, it makes two soft standard size pillows. A wool batt 90″ x 90″ is the right size to wrap the top of a king size mattress with enough room to fold down the sides to meet another batt wrapped underneath the latex. Folded in half with a little more stretch, it will fit a full size wool topper. Cut in half, it makes two firm standard size pillows. It would also make a queen sized comforter or quilt. Because there is no carbonizing or use of sulfuric acid, there may be slight vegetable dust in the batting. The carder has aligned every single fiber and removed any strips of straw and grass. 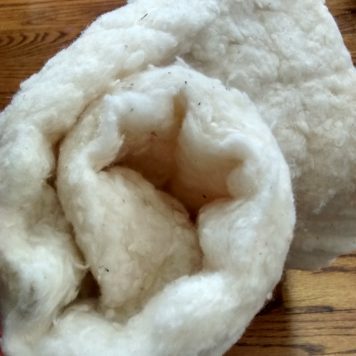 However, as the sheep are pastured and don’t wear coats, vegetable matter does accumulate in their wool. 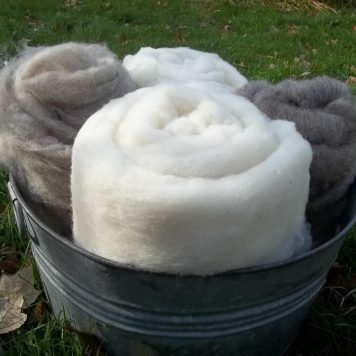 As we get our wool from multiple farms, each pasture has different vegetation and each sheep pulls in different amounts of plant matter, so not every wool batt will have its own character.